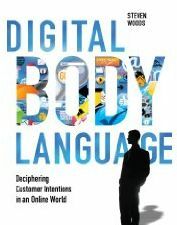 I’m not sure if I like the term Digital Body Language, but Steve Woods’ book with that title I like very much. It clearly shows how the role of marketing in the complex sales has changed, and gives lots of detailed suggestions on how marketing teams can cope with this change, by using smart demand generation strategies. Where sales people used to look at the prospect’s body language to gather important information, the marketing team can now collect huge amounts of information from the prospect’s online behavior. Steve calls this pool of data the Digital Body Language. It is marketing’s task to use the digital body language to move prospects through the funnel until they are sales-ready. This can be done by calculating lead scores and nurturing the prospects based on their stage in the buying process, their role, interest level and communication preferences. A key element of marketing’s new role is to capture all possible data about the prospect. Everything should be recorded: email clicks, responses to direct mail, visits to the website, and so on. All this should be added to the prospect’s profile in a centralized database. This also means that data quality is getting more important. The data should not only be centralized, but also normalized and free of duplicates and errors. This is also a key recommendation of another popular B2B Marketing book: Lead Generation for the Complex Sale by Brian Carroll. A next step is to nurture the prospect according to the prospect’s stage in the buying process, not according to the vendor’s preferred sales process. The prospect’s online behavior gives hints about where they are in the buying process, and it’s marketing’s task to distill this information from the prospect’s digital body language. Steve also advocates more collaboration between sales and marketing. He suggests several ways to involve sales more closely in the nurturing process: letting sales initiate certain marketing initiatives, such as a specific lead nurturing program; letting sales send back leads to marketing if they’re not yet ready to buy; giving sales people notifications of important prospect activity, such as website visits or jumps in lead score. And finally, the entire marketing process must be optimized continuously, based on the wealth of data that is now available. Not only can you measure the number of marketing-qualified leads, but also the percentage of leads that are subsequently accepted by sales (which should ideally be 100%). All these changes requires marketing people with a different skill set: more analytical, process driven. It’s not about pretty graphics anymore, it’s about capturing and analyzing prospect’s data and intelligently running campaigns based on this data. Then analyzing the results and optimize continuously. Digital Body Language is not an easy read, because it’s chock-full of information that has never been put in a book before. Steve has added about two dozen case studies, which are brief but provide practical examples that make the book come more alive. All in all, I think this book will soon become a classic in the demand generation space. Steve Woods is CTO and co-founder of Eloqua. He blogs on the Digital Body Language blog, and the Eloqua Artisan blog. His Twitter name is @stevewoods. This entry was posted in Demand Generation and tagged book review, Demand Generation, digital body language, eloqua, steve woods on February 8, 2009 by Jep Castelein.